We are entering an Enterprise dinghy in the Southport 24 hour race. 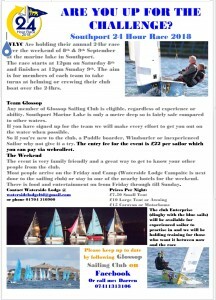 See the poster and sign-up sheet in the club house for more details. 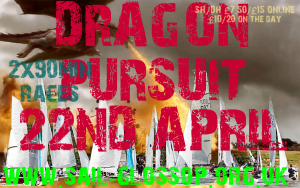 The Dragon Pursuit two 90 minute (Mirror Start) Pursuits, sailed on Glossop SC challenging 160 acre 1.4 mile long Torside Reservoir. First race starts at 11pm followed by a break for lunch and then onto the the second race. The Galley will be open all day for Breakfast, Lunch and refreshments throughout the day. Prize giving will be in the bar. Entry is £7.50 for a single hander and £15 for a double online. This rises to £10 and £20 if you pay on the day.